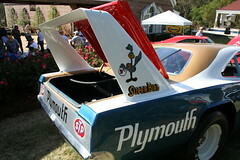 The Plymouth Superbird is a car you will never forget once you see it. If you ever saw it on the race track there was nothing like it…well, other than the Dodge Daytona! Even when it was on the smaller ovals out in the Midwest in 1970-71 it was a site to behold. Ramo Stott owned and raced this beauty to the 1970-71 ARCA Championship and it still retains its original sheet metal and is unrestored. We have just added this historical race car to our Feature Car page and encourage you to take a look, it is a very rare example of a time long gone. Click Here to see the Feature Car page for Ramo’s car. The video below is a behind the scenes look at Speed TV’s Rutledge Wood interviewing car owner Doug Schellinger at the 40th Reunion of the Aero Cars at Talladega Speedway in 2009.